Calabogie lake Beach front is a 4 minute drive from our Logview, Peakscottage, Moutainview and Peaksview. A boat launch is included. 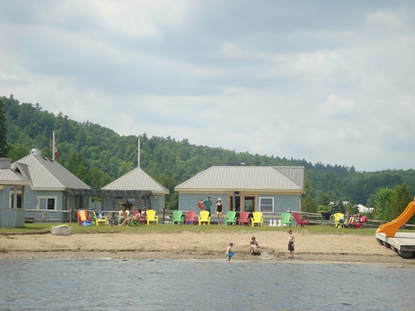 The beach has both sand and grass areas for sun bathing along the crystal clear water of Calabogie Lake and a covered area to relax out of the sun. The beach has a gradual slope into the water for the little ones to enjoy safely. Washrooms, picnic tables, by the hour kayak, paddle boat & canoe rentals, canteen service, parking, licensed L.C.B.O., boat docking facilities, mountain bike rentals, volley ball, hiking/biking trails nearby. Canthooks Calabogie Peaks Resort Reservations are recommended call 1-613-752-2720 x 1610. Call 613-295-2201 No texts please.